RenderDoc has integration with AMD’s Radeon GPU Profiler. 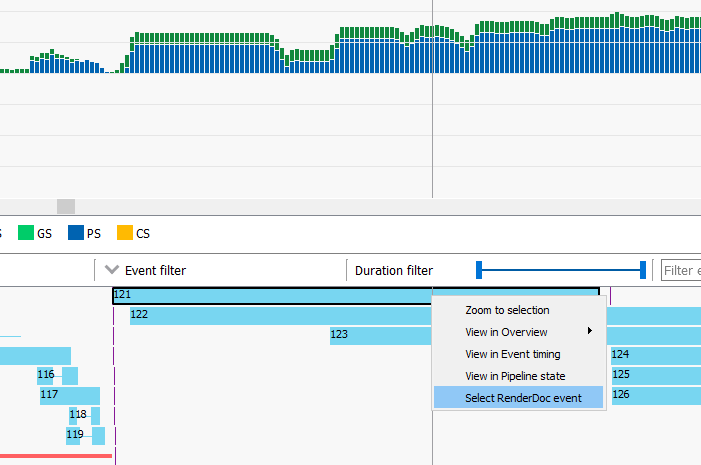 This allows you to generate an RGP profile from a RenderDoc capture, embed the profile in the capture file, and synchronise the view of the frames between RenderDoc and RGP. By default the RGP integration is disabled. To enable it go to the Settings window and in the Core section enable Enable Radeon GPU Profiler integration. To begin you will need to go to the Tools menu and select Create new RGP Profile. If this menu option isn’t available, you need to have the latest AMD drivers installed on your machine. Selecting this menu item will open a small popup and spend a few second creating the profile itself. After the profile is created, the RGP profiling tool will automatically open up. If you haven’t configured the path to the RGP tool, you will be prompted to here. Once the path has been configured successfully the tool will open. After generating a profile above, the RGP data is embedded in the .rdc file. Since RGP can open a profile on any machine without needing AMD drivers or hardware, this embedded RGP profile can be opened at any time by going to the Tools menu and select Open RGP Profile. The RGP tool will open just the same as if the profile was newly created. If using RGP version 1.2 or higher, once both tools are open they have a synchronised view of the underlying data. This means that within RGP you can select an event, right click and choose Select RenderDoc Event. This will bring RenderDoc to the foreground with the event selected. 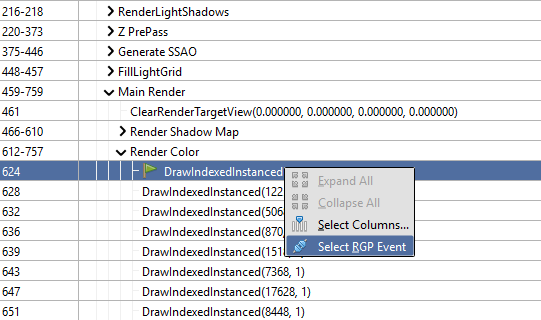 Similarly in RenderDoc you can right-click on an event in the event browser and choose Select RGP Event which will perform the same operation in reverse. Since RGP and RenderDoc have different scopes, purposes, and views of the frame the numbering of events will not be the same between the two tools.